Some of the highest rates of exclusions from Derby’s schools are of girls from the Roma community – yet they want to be at school, and get an education. Why is there this conflict? An innovative 3 day workshop was held recently, run locally by experienced youth workers, funded by Derby News, with 3 young Roma girls aged between 13 and 15. The objective was to explore many themes around life skills, empowerment, their environment, what they want from the future….and how would they like to change things. The event closed with all 3 girls making presentations to a small panel, and briefly describing an idea that they would like to run with, resulting from this course. Initially, they didn’t see the point, why say anything, no one would listen, no one would do anything. Their words would just evaporate once they walked out of the door! I was on that panel, and to hear the words spoken by young, vulnerable girls was very moving. In Derby, in 2017, no one should be subject to racism, or bullying, no one should be in a position where they feel that the school staff at Merrill Academy are not listening to them, and where the institution seems to them, to be more focussed on excluding them rather than working with them. There are always 2 sides to a story, and no one is suggesting that these girls are “angels” all of the time – they’re teenagers. But this is how they feel…and that has to be a starting point. After all, they are still children! 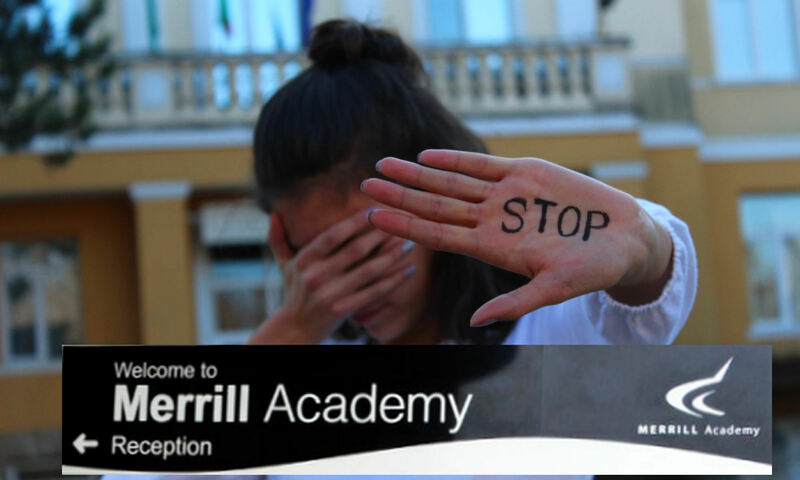 So I am X and I go to Merrill Academy. There are a lot of problems in school and a lot of racism and I want to do something about it. This is important because it makes you feel sad and scared and it stops you from learning. Learning is important because you want to get an education. If you don’t get an education then you can’t get a house and you won’t have any money. So I want to go to school and talk about this. I’ve been there and I want it to stop. I know how other people feel, and I want to help people. I’ve been there and I got bullied, they used to call me names like “Czechy, go back to your country” and I want to stop this – I think that this is not good. They make people think that they are nothing on this Earth and that’s the problem. I want people to feel wanted. I want them to feel happy. I want to see them smiling so they feel better. I am here to tell you why it is important not to bully someone. Bullying is important, because it affects people’s lives. By this I mean people can kill themselves and people can get mental. I witnessed it when I got bullied in secondary school with my cousin. I used to be a normal girl with normal beautiful thoughts. But since the day I got bullied my life changed. I wanted to tell teacher what is going on and I did say it but they didn’t get it or they didn’t care. But for me it was literally like a nightmare because the feeling that nearly everyone in school was bullying me was killing me slowly and slowly. And this day came when I had enough of it and I wanted to finish it by ending my life but when I was thinking I reminded myself that while they bully me and my cousin they are killing us, but for them it is funny because they thought that they ain’t going to do nothing about it. So I got mental and since then I fight people and they are a little bit scared of me. At first it is alright being bad but then I wanted to change myself to the real me. But I don’t work until now. Because the pain that I had – they won’t never feel it until it happens to them. So I started to be naughty in school, I didn’t care about my education but then I started to behave but teachers were blaming me for things I didn’t do so they put me at night school. So I decided to change my life, change loads of things about myself….and that’s my story. By this story I want to tell the whole wide world to STOP BULLYING. ‘Cos it affects their lives. We could make a campaign at school. So my name is Z I’m 15 years old. I’m here to speak about me because I want to change my life. I want my life to be better and happier. What I mean by this is that when I came to England I was 13 and I couldn’t speak English – I did, but only a bit, so then I went to a school called Merrill Academy. When I went into that school I had friends so I was good because they helped me a lot. After 2 years, everything changed, students from that school started to be racist to Slovak and Roma people. So I said, how can we change this to be better? First thing I did was to see some teachers and tell them what’s going on but the teachers weren’t listening to me. So then I started fighting and started to be excluded and that every day was worse and worse! So now I am in year 11, and I want to improve my behaviour and be better because I want my future to be good. I want a good job so I can help my family out and myself too. Now I would like some help because I want to do well in my exams and I know that also other people need help with their homework. So I need you help and advice to set up the homework club. I will need a room – I will need books and some pens to write with. Women’s Work: a thriving and growing women’s centre continues in Derby. Bullied children, and adults too for that matter, have only a limited number of responses. They can run away, they can crumble or they can fight back. Fighting back, without a clear strategy and support, often leads to trouble for those fighting back. In effect being penalised by the system for defending themselves. From the comment made by the headmaster, he knows all the right words. He does not seem to have had much success in implementing them, if indeed he tried ? My thoughts and best wishes to these young people, fighting back against a system weighted against them. I wish them success.